DyScratch from DyVision Works is a VST instrument (VSTi) for use in Windows DAW programs. It provides a producer or songwriter with the ability to create 'scratch' sounds / effects from their own samples or recordings without leaving the sequencer environment. What’s more, every single parameter (including the actual 'scratch' motion and speed) can easily be recorded, tweaked and automated using MIDI from within your VST sequencer environment. DyScratch can also be 'played' live using a standard MIDI keyboard. 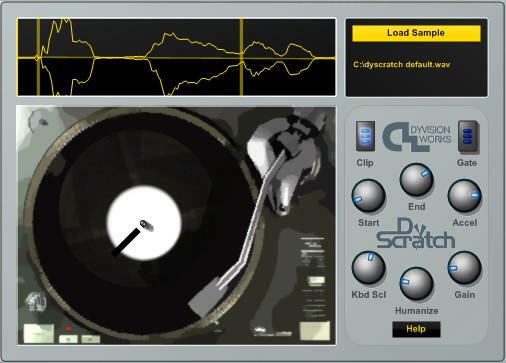 • Load and scratch any standard wave file (.wav 16 or 24 bit) • Integrates seamlessly with VST hosts that support the VSTi format • ALL parameters can be recorded and automated via standard MIDI • Scratch your samples 'live' using a controller keyboard with a pitch- bend wheel, or play scratches using the keyboard (this feature is unique to DyScratch) • Set the start and end points of the range within the sample you want to scratch. For example you could load an entire breakbeat and isolate just the snare, then scratch the hell out of it! • Wave display for a visual representation of start-end points as well as the current scratch position within the wave. • Optional 'Gate' can be used to create crossfader cuts and FX. • Animated turntable. • Bulit in 'Clipper' effect simulates overdriven vinyl levels. • Variable 'Humanize' function simulates the human touch. Our customers include • One of the worlds largest (and most notorious) video game companies • Recording studios • Film studios • Green screen studios • Radio stations • And of course, individual producers who just want better sounding audio We hope our pricing is fair and affordable by all. The full versions of our products do not contain ANY copy protection schemes, not even a serial number, as we believe copy protection only serves to annoy legitimate users. You will never have to 'beg us' for another 'activation' to work in a different studio or on a different computer.